Desaru Coast, Malaysia: The latest addition to The Els Club Malaysia brand is poised to boost the growth of golf tourism receipts in the country. Muhammad Zainal Ashikin Muhammad Rejab, Executive Director & Chief Executive Officer of Desaru Development Corporation Sdn Bhd (DDC), said: “Further to being one of the leisure attractions that will drive interest in our destination developments, The Els Club Desaru Coast will also boost the growth of golf tourism receipts in Malaysia as the demand for quality golf standards increases. 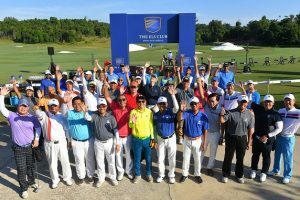 Participants at the The Els Club Malaysia Invitational. Muhammad Zainal was speaking as The Els Club Malaysia Invitational welcomed more than 50 high level executives from the region to compete at the 18-hole The Els Club Desaru Coast – Valley Course co-designed by Vijay Singh and Ernie Els Design, a Full Business Member of the Asian Golf Industry Federation. “Today was designed for us to showcase the latest addition to The Els Club Malaysia brand; the Valley Course, whilst giving us the opportunity to host an exclusive group of guests for the inaugural The Els Club Malaysia Invitational,” added Muhammad Zainal. As well as playing the course, guests enjoyed an up-close-and-personal clinic with Gavin Green, Malaysia’s brightest golf talent. Green spent time demonstrating how to execute a range of shots and shared advise for the attending golfers on how to perform their best. The unveiling of the Valley Course is the third instalment, adding to the Ocean Course and Rainforest Course. With two locations in Malaysia – Teluk Datai and Desaru Coast – the brand has quickly established itself as one of the best golf experiences in the region. Guests of The Els Club Malaysia Invitational were also treated to a stay with exclusive event hotel partner, Sand & Sandals Desaru Beach Resort & Spa. The Els Club Malaysia Invitational was won by Dato’ Hj Bahari bin Abdullah. Managed by Asian Golf Industry Federation Executive Member Troon, The Els Club Desaru Course is primed to set the benchmark for service and premium experiences in the region. The first addition to The Els Club Malaysia portfolio, The Els Club Teluk Datai shot to fame in 2014, scooping several illustrious accolades, including: The World’s Best New Golf Course by the World Golf Awards 2014, and ranking #83 in Golf Digest’s Top 100 Courses in its first year of operation. The Els Club Desaru Coast, meanwhile, with 45 holes of golf (the 27-hole Ocean Course and 18-hole Valley Course) set out alongside the region’s first Els Performance Golf Academy and the Academy Par-3 course, makes this one of the most comprehensive golf destinations in the world.